The French Rivera is dotted with villages perchés, clinging almost impossibly to the tops and sides of hills throughout the countryside. On a family excursion throughout the Côte d’Azur, it became a mantra to discover which of these often- fortified villages could outdo the next. 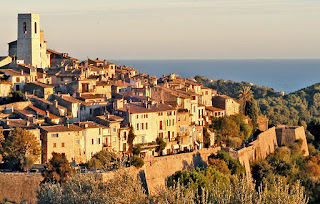 Our favorite was clearly St. Paul (also known as St. Paul-de-Vence), a marvelously preserved and restored gem with cobblestoned climbs and virtually intact ramparts still protecting it from the warring factions of yore. Just 12 miles outside of Nice, the village towers over the rolling hills and rich valleys of the Vence countryside. The sight of St. Paul has inspired artists throughout the years to sketch its precarious foothold in the sky, and my husband and sons responded in kind. Just short of donning French berets to complete the tableau, they parked themselves on a curb outside the stone arched climb into the village to draw this 16th -century miracle. Armed with colored pencils, fine-point markers and sketch pads, my three budding artists sat in pictorial juxtaposition with an intense game of boules just around the bend from the famed Colombe d’Or. Originally a gathering place and café for young and unknown painters in the 1920s, the Colombe d’Or now rates as one of the Riviera’s toniest restaurants. While a seat at the walled, garden patio is a delight on one of the Riviera’s azure-blue, sunny days, it is considered a coup to experience the old auberge itself. 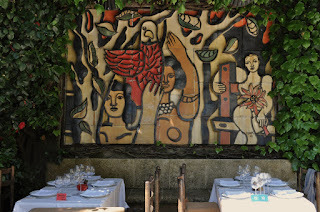 Only those staying at the inn or having confirmed dining reservations are allowed a look at the Colombe’s esteemed art collection, which rivals that of the nearby Fondation Maeght. In return for lodging and viands, Modigliani, Bonnard, Braques and other then-unknown artists contributed paintings which now adorn the walls of the auberge. Struggling artists were later followed by intellectuals of the literary world such as Camus and Prévert and later-day French film icons Yves Montand and Simone Signoret. Turning the bend, past the multi-generation “bowling” competitions held daily across from the Café de la Place, one enters the medieval world of St. Paul, up a short climb and through a well-defined entry arch. Ascending St. Paul’s narrow pedestrian-only main street, the Rue Grande, one can almost touch the 17th and 18th century homes on each side, many filled with elegant and creative art and handicrafts galleries. The artist tradition continues at every turn, leading to the town’s most spacious gathering spot, a square of sorts around an urn-shaped fountain. Popular as a tourist destination, St. Paul offers a variety of shopping choices and cozy restaurants, but few options for family dining. If traveling with children, put together a picnic instead with fresh bread, cheese and cold cuts from the local boulangerie and charcuterie outside the walled city. Digressions up the stepped streets off the Rue Grande lead to such gems as the 12th century gothic church on the rue de la Castre, with a commanding position overlooking the village. France’s rich religious heritage is revealed in the church’s lavish interior décor and its celebration of the Jubilee, replete with colorful tapestries and flowers adjacent to traditional oil canvases and carvings. Among the church’s interesting art pieces is a painting of St. Catherine of Alexandria attributed to Tintoretto. An escape from the crowds and a particular delight at sunset was a stroll along the parapet walk adjacent to the thick stone wall ramparts that encircle St. Paul. 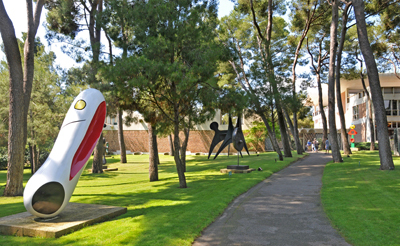 Surrounded by the coat-of-arms brandishing homes lining the walk, one could easily time travel to a simpler world when views of the Alps, the sea, and the Esterel provided the inspiration for new artistic palettes and a fitting motivation for the location of the Fondation Maeght, further down the road. 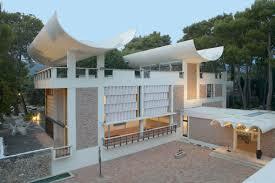 Simultaneously an interior and exterior art museum, the Fondation Maeght feels like a college campus, set in a rich green forest with art works all around. Designed by architect José Sert in 1964, the sprawling modern art museum ranks among France’s most significant, with notable works by Chagall, Miró, Calder, Braques and Bonnard. Rotating exhibits of the Fondation’s permanent collection of 20th century art are displayed with an awareness of color and presence. The use of cameras and video equipment is permitted for a small charge and is highly recommended to capture the excitement of the expansive outdoor sculpture garden as well as the airy rooms inside. Especially enchanting for the entire family is the Labyrinthe de Miró, a statue-filled maze of trees, water and gargoyles. To reach St. Paul, park your car very carefully in the car park down the road from the arch. Parking spaces are surprisingly narrow and the spiraling turns in the garage require skillful negotiation. Expect to be bombarded after exiting the garage by numerous shops all hawking household items with the ubiquitous yellow and blue colors of Provence. Purchase memory cards, instead, and bring back a photographic souvenir of the wonders of St. Paul.